Andrew & Viola Lehman Shelly, 1990. Family photo. Andrew R. Shelly: pastor, seminary and mission executive. Born 13 January 1913 in Pennsburg, Pennsylvania, to Rev. Elwood S. and Katie (Rickert) Shelly, Andrew was third in a family of two sons and two daughters. In 1952 he married Viola Lehman, daughter of William and Caroline (Flueckiger) Lehman of Berne, Indiana. They had a son, David, and a daughter, Linda. Andrew died 18 November 2001 in Newton, Kansas. Shelly moved to Philadelphia, Pennsylvania, at age 21 to study at the Bible Institute of Pennsylvania and serve as assistant superintendent of Philadelphia Gospel Mission. Following graduation, he attended Bluffton College. During this time he became part-time pastor of an Eastern District mission congregation, Napier Mennonite Church, Bedford, Pennsylvania, to which he commuted by bus or hitchhiked for hours each way from college, especially during summers and vacations. A 1939 Bluffton graduate, Shelly completed seminary education at Hartford (Connecticut) Theological Seminary. While there he was called to his first full-time pastorate at Stirling Avenue Mennonite Church, Kitchener, Ontario, serving from 1942 to 1950. He helped lead the church to affiliation with the Eastern District of the General Conference Mennonite Church, and during this pastorate began a long participation in many conference-wide committees, including ministry, film, church unity and missions committees. In 1947, the congregation released Shelly part-time to raise funds for the new and financially struggling Mennonite Biblical Seminary in Chicago, Illinois. For more than a decade he represented the seminary in hundreds of churches throughout the U.S. and Canada, serving full-time as a fundraiser and part-time faculty member beginning in 1951. He was the principal fundraiser for the seminary campus built at Elkhart, Indiana, and he moved to that city in 1958. 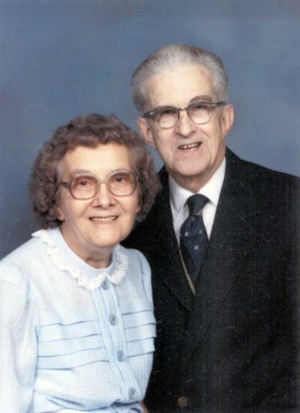 Shelly was married 28 June 1952 to Viola Lehman at First Mennonite Church, Berne, Indiana. From the time of their marriage, she was an essential participant in his life and ministry, whether in teaching children, packing thousands of suitcases, traveling with him, or caring for him in his later invalid years. Pursuing their missions interest, the Shellys took a five-month trip to mission fields and relief projects in Asia, Africa and Europe in 1954-55. This commitment to missions turned into a full-time responsibility in 1960, when he became executive secretary of the General Conference Board of Missions in Newton, Kansas. During his term, the mission team grew to a peak of more than 200 workers. In the 1970s and 1980s, Shelly returned to pastoral ministry in Kansas, serving in various leadership roles at Hopefield Mennonite Church, Moundridge; First Mennonite Church, Newton; and Emmaus Mennonite Church, Whitewater. During these years Andrew was active on several nationwide boards, both Mennonite and non-Mennonite. He focused on fundraising and publicity while serving on the board of the Germantown Mennonite Historic Trust in Philadelphia, Pennsylvania. Simultaneously he was serving on the boards of the American Bible Society, New York, New York and the Haggai Institute, Atlanta, Georgia. Kansas community involvements included board memberships for Mirror, Inc. (substance abuse), MIDKAP (poverty agency), Newton Release Time Bible School, and Newton Area Social Workers Coalition. Throughout Shelly’s ministry, he presented thousands of sermons in congregations, conferences, and retreats around the world. He was also a prolific writer of newspaper and magazine articles, often in Mennonite Weekly Review, Mennonite Life and missions publications. Frequent topics included missions, stewardship, Bible distribution, alcohol, abortion and world hunger. In 1992 he became a quadriplegic in an accident, and later became blind and bedfast. Nonetheless, to the end he maintained a lifelong interest in the work of the church and missions. Andrew R. Shelly Collection, Mennonite Library and Archives (North Newton, Kansas). Franz, Delton, Carl Kreider, Andrew and Viola Shelly. Let My People Choose. Scottdale, Pa. : Herald Press, 1969. Shelly, Andrew R. Answering the Great Commission. Newton, Kan: Board of Missions, General Conference Mennonite Church, 1955. Shelly, Andrew R. Congo Calls: CIM Challenge. [Newton, Kan.]: Missions Today, 1966. Shelly, Andrew R. How to Live Well and Give Liberally. Newton, Kan.: Faith and Life Press, 1964. Shelly, Andrew R. India: Hour of Destiny : Partnership in Mission. Newton, Kan: Board of Missions, General Conference Mennonite Church], 1966. Shelly, Andrew R., and Ruth L. Ratzlaff. India Report. [Newton, Kan.]: Board of Missions [General Conference Mennonite Church], 1966. Shelly, Andrew R. The Minister and His Young People. Newton, Kan: General Conference Mennonite Church, 1950. Shelly, Andrew R. Thinking Things Through About Being a C.O. Kitchener, Ont: [Shelly, 1940. Shelly, Andrew R. United for Action for Christ and the Church: A Plea for Loyalty to General Conference. S.l: s.n. ], 1951. Shelly, David. "Shelly, Andrew R. (1913-2001)." Global Anabaptist Mennonite Encyclopedia Online. March 2012. Web. 21 Apr 2019. http://gameo.org/index.php?title=Shelly,_Andrew_R._(1913-2001)&oldid=105426. Shelly, David. (March 2012). Shelly, Andrew R. (1913-2001). Global Anabaptist Mennonite Encyclopedia Online. Retrieved 21 April 2019, from http://gameo.org/index.php?title=Shelly,_Andrew_R._(1913-2001)&oldid=105426. This page was last modified on 8 January 2014, at 20:44.